Anyone who knows me understands that I wear my veterans advocacy on my sleeve. As Commander of the VFW, I have been very involved in veterans issues and helping our service men and women. Commissioner David Brock Smith has been a supporter of our veterans long before his run for state representative. He doesn’t just talk about veterans issues and advocacy, he acts on it. Although Commissioner Smith has years of public service, he has never served in the military. He is, however, the son of retired Navy Lt. Cmdr. Frank W. Smith. I have always said that, “you don’t need to be a veteran to understand a veteran,” and Commissioner Smith understands veterans. He has always had an open ear and has worked to help solve problems within our veterans community. Commissioner Smith has testified before the State Legislature in support of veterans issues and assisted in our Veterans bill, Measure 96, in getting to the ballot for our approval this November. Measure 96 will allocate 1.5 percent of the net proceeds of State Lottery funds to veterans services. Commissioner Smith, as our next State Representative, will continue his work on this and make sure these dollars go to the veterans services as intended. Join me, Wayne Krieger and many others, in helping our veterans, and let’s elect Commissioner David Brock Smith as our next state representative for House District 1. He has the leadership, experience and dedication we need to get the job done for all of us. David Brock Smith represents the citizens of this district with a passion that is difficult to describe. This isn’t a job to him, it is a purpose. Commissioner David Brock Smith was part of the hiring committee that brought me to Curry County. During the process I was contemplating if I had made the right decision in relocating here. After my first face to face meeting with him, I was inspired by his passion to do everything he possibly could for the citizens of Curry County and I am certain that this will continue in Salem for all the citizens in our district. During the time that I have had the privilege of working alongside Commissioner Smith he has always remained true north in his intentions to better our communities. David has built working relationships and a positive reputation with those in State Legislature and has the fortitude, knowledge and experience to move matters forward that will benefit our communities greatly. David is a true leader, and one that leads by example. He values people, their input on decisions, listens to their concerns and is proactive on finding solutions. There is no wonder to me why Representative Krieger supports and endorses David Brock Smith, to take his place in Salem. I hope you join us in supporting David as our next State Representative for House District 1, a true advocate for the people. Wayne Krieger is asking us to support David Brock Smith as his successor as State Representative. I know David first hand and while I may not always agree with him politically, I am a huge fan and supporter of his. His heart and mind are always on the greater of his constituents and Oregon in general. The respect for principles of succession, not just based on friendship, but proven civic work – action and results – is why I believe and agree with Wayne’s support for his successor. I believe David Brock smith has the experience and working knowledge at all of our federalism’s three layers of government. His working knowledge allows him to be a voice with passion and experience for us in rural Oregon. Small rural counties are often forgotten at the State level and David makes sure that we are not overlooked. It is for this reason that I adamantly support David Brock Smith for State Representative. As you know the position will be decided by vote on the next ballot. This is a very important decision. I am writing this because I have worked closely with David and am convinced that he will do us well if elected. We have been members of the Curry County Budget Committee four years now. A very difficult job giving the austere resources available and the requirement that the budget must balance out. David always comes impressively prepared. As a Port Commissioner and former City Planning Committee member, I have witnessed firsthand David’s accomplishments. These are just a few of the works of what I have observed concerning his qualifications and performance to represent House District One in the State Legislature. Complete grasp of budgets, their corresponding funds and the services they provide citizens. Knowledgeable advocate of our fisheries and the communities they serve. Full knowledge of the land use procedures. Srong advocate for our private property rights. Complete understanding our rural issues and a tireless advocate for our communities. I am convinced that if elected to the State Representative position that David Brock Smith will dutifully serve all the people of District One. He has earned my strongest possible endorsement. I am writing to endorse David Brock Smith, in the Oregon State representative for House District 1, in his quest to replace Wayne Krieger, who has so faithfully served our region. I first met David when he campaigned for his position on the Curry County Board of Commissioners several years ago. I have been very impressed by his transparency and decorum when under fire. David was instrumental in getting a resolution supporting the Second Amendment in Curry County passed after he placed in on the agenda. I have spoken in depth with Krieger and David about the timing that resulted in Krieger retiring and David accepting the mantle to move forward, and I am very satisfied. I look forward to continuing the tradition of Krieger’s representation of Southern Oregon. Join me in voting for David Brock Smith, Oregon State Representative House District 1. I had served with Jim Whitty about a month when he told me he should have served as Commissioner first, before four terms in the Oregon Legislature. Now we have an opportunity to send a Curry County Commissioner to the House. He already knows the needs and public safety issues of the people of the South Coast, and will be a better representative of his constituents for having served as a Commissioner. Join me in supporting David Brock Smith for the Oregon House of Representatives. Although I have worked with David Brock Smith for many years as a legislator and county commissioner and find he has a full grasp of the issues, he is able to navigate the capital to get things done and works hard for us in Southwest Oregon. I have been waiting until after the Chamber of Commerce candidate forum to write this letter of endorsement. David showed us all why I, retiring state Rep. Wayne Krieger, Sen. Jeff Kruse, and so many others support sending him to Salem to work for us. David has been fully involved with and understands the fish, farm/ag, forestry, economic development, education and health care industries that we all rely on for jobs, services and the overall health and safety of our communities and their residents here in Southwest Oregon. He understands what it takes to make a payroll in private business, which is lacking in Salem. David, quite simply, just gets it, and out of all the candidates in the forum, that was well apparent. David Brock Smith is a good man, hard worker and the candidate who understands our rural Oregon values, economies and residents. His first priority is to support the people of House District 1. David has earned my support, and I look forward to working with him for all of us here in Southwest Oregon. I hope that you join me in supporting David Brock Smith for state representative. With the issues that face our State, especially rural Oregon, it is so important to have State Representatives that have the Leadership, Experience and Dedication to get the job done, David Brock Smith embodies all three. As a fellow rural County Commissioner in Umatilla County, and the President of the Association of Oregon Counties (AOC), I have had the pleasure of working with Commissioner David Brock Smith on legislative issues that are positive to residents, while also advocating together against bad legislation. Through his positions on the Board of Directors, Legislative, Public Lands & Natural Resources, Energy, Environment and Land Use Committees of AOC, David has shown all of the qualities mentioned above, and has applied them in the Legislature to the benefit of our residents. Commissioner Smith has also shown leadership in the Legislature, working with the Coastal Caucus, Agencies, and Legislators, for needed funding of the Sudden Oak Task Force he initiated, to address this serious disease. David is versatile in his work, and is championing needed Affordable Workforce Housing Legislation that will create jobs, benefit residents, businesses, builders and contractors. We see the viable benefit of his Legislative Concept to residents, and will continue to work with him on it. Commissioner David Brock Smith has the Leadership, Experience and Dedication to get the job done for rural Oregon, and we hope to continue to work with him to do just that, as State Representative. I’ve known and had the pleasure to work with David in multiple capacities for many years, and he has earned my highest endorsement as our next State Representative for House District 1. House District 1 is vast, and covers the areas of Southwest Oregon from Brookings/Harbor to Charleston, then to West Roseburg and the Melrose/Lookingglass area in Douglas County, then down I-5 coming west of Cave Junction to the border. The Residents, Communities and Economies within this District are diverse, with a fishing, farming and forestry emphasis throughout the District, and I know of no one who would be better suited to represent us and our communities, than David. I followed David in his years as Chamber President, and his work to bolster the businesses of the South Coast. I worked with David in his capacity as a City Councilor, and witnessed his leadership and attentive ear to his constituents. I worked with David as a fellow School Board Member; in our respective districts, and appreciated his engagement and experience in building partnerships for a strong board team to better education and vocational programs for students. Last but not least, I have worked with David as a County Commissioner, and have observed his steadfast dedication to improving the quality of living for the residents of the South Coast. I am proud to support David Brock Smith for State Representative, and look forward to his continued work on our behalf. It is a privilege to write this letter of recommendation for our colleague, Curry County Commissioner David Brock Smith, and join Representative Krieger, Coos-Curry County Farm Bureau, Oregon State Sheriffs, residents and elected officials from around our region, in endorsing David for state representative. As the elected treasurer for Curry County, I have had the pleasure to work with David for many years. His understanding of budgets, resources and their revenues, departments and their services to residents, not just for the county but for the districts within the county — schools, ports, and cities—is incredible. David understands our forest and natural resource industries and works with and works hard on their behalf, while being extremely fiscally conservative. This knowledge and understanding will serve us well in Salem as our next representative. I also wanted to take this opportunity to not only tell you about David’s wealth of experience and service to our residents, but how he truly cares about the people he works for, all of us. His dedication to us all, our industries and our culture is just amazing. His passion for his work on our behalf is so refreshing and he has a way of explaining the issues for all to understand. I also appreciate his down-to-earth attitude and how he earns the respect of others. I sincerely hope you join us in electing David Brock Smith our next Oregon State Representative, House District 1. 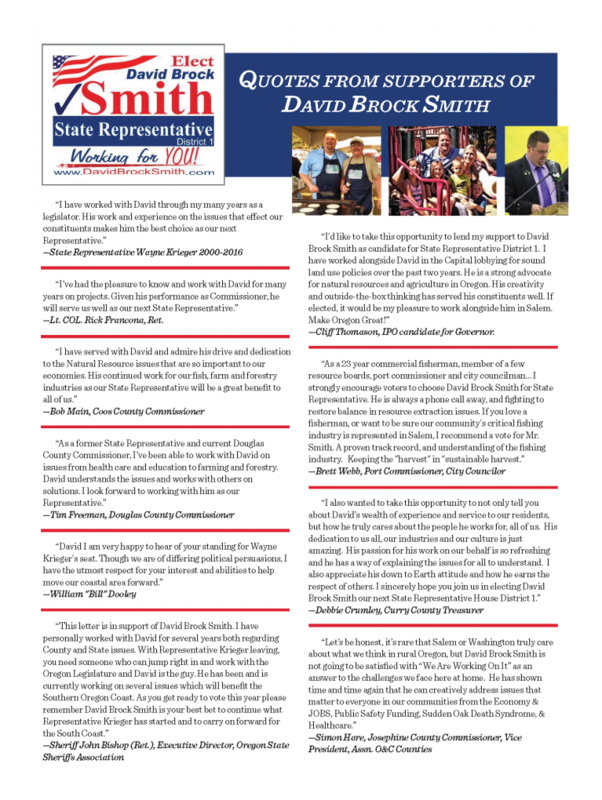 If you would like to send me an endorsement, send me an email at David@DavidBrockSmith.com.